Make the run to Georgetown enjoyable. Visiting my airplane has been a high stress event for me. Stopping in to see no progress repeatedly can be disheartening. I might as well make it as much fun as I can, so I shrugged off the light rain and overcast skies to ride the new Harley on down. It made for one of the best rides I’ve had yet. Smooth power throughout, great exhaust sound, minimal vibration with this new engine design, and even great traction on wet roadway. This new machine is smooth, and I’m loving it. I spent some time the night before loading music onto a thumb drive. I’ve been having mixed success with the Harley Music System, and am still figuring out the options for this machine. Sometimes it stops responding at all, and other times it works but won’t respond to next track commands from the hand controls. I left my phone running on Pandora so that I could link to that as an alternative in case the USB option stopped functioning. I’d be sure to have music for the entire ride, no matter what. As it was – the thumb drive option broke down half way through the trip. More on the end result at the end of this post. I’m behind: I know I owe you several posts covering March, April, and May. I guess I’m still holding writing off until I can jump up and down and report very positive news on N833DF. Getting my airplane in it’s hangar within 20 minutes of home at on the airport where I work would put the finishing touches on this new home of ours. The final piece of the puzzle. Those additional posts, including more details about the really cool jet flying I was able to do with my friend Eric, will have to wait a few more weeks. Bev and I are focusing our time on getting her parents healthy, and are dedicated to that role for now. Meanwhile, I’m studying to become an examiner in the WestWind, and am working to improve my everyday product delivery in both the Westwind and the Astra. I set high standards for myself and don’t always achieve them. I find this job easy to do, but sometimes frustratingly difficult to do with finesse. From a health point of view – Bev and I have begun exercising everyday and practicing a low carb diet. It is working and we are doing well with it. It would be awesome to drop 30 lbs, and I plan to have a least gone half way to that by September. Progress on N833DF remains disappointing: As I’ve said before, what should have taken two months has now taken more than 18 months. I’ve paid a steep price for the direction I’ve chosen here, but I’m expecting that pain is nearing an end. Matt is a talent, but an easily distracted one. What has changed as of this visit is that he is actually working on my airplane. Rivets went into the left wing today that will complete the installation of new parts in the gear box assembly. 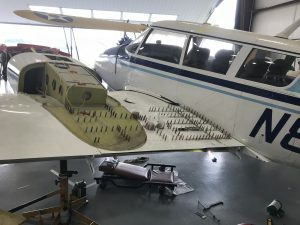 That was the last of those parts I was able to get from Piper, so we’ll search one more time for another on on the right, and then built that one. The right wing should get started shortly, and I’ll report on that in these weekly updates. That is all of the bad news at the moment. N833DF will miss most of this summer and the maintenance decisions I made continue to have a significant impact on Bev and I. There is some good news though. Historically, the problem with choosing Matt was has been of personal and professional demands placed on him from all directions. His decisions on how to prioritize those demands have historically not been in my favor. With a growing family, his own business interests, and his relationship with the B-25 Panchito, there has simply been too many distractions for him to keep his promises. Matt’s talents with airplanes are noteworthy, and that has been enough to encourage me to stay with him. At this point, I am well beyond the point of no return in the project, so I’m committed not to change until the work is completed. I have learned allot in the process, but the price has been steep for sure. 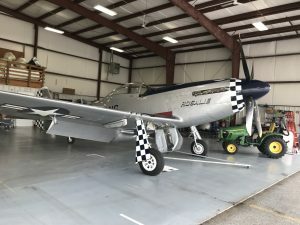 There is continued risk in that not all of his distractions are gone: In his new work hangar, Matt is surrounded by an exciting array of airplanes including King Airs, T-6s, and even a P-51. He is both maintaining and learning to fly these aircraft – a very exciting prospect. It seems as if he really wants to finish me up, if for no other reason than to get get me out of his way. I’m good with that, and hope that sentiment continues. Stablemate to my airplane. Good Company! I’ll stay involved each week to monitor progress and report with pictures throughout the home stretch. One day I might show up and even have my expectations actually exceeded. Wouldn’t that be amazing. Next Steps to prepare: When the end gets a little closer, I’ll review the logs and start re-activating my radios and services like XM Weather. Then I’ll write a series of test flight profiles to ensure all the systems that were overhauled and modified are properly tested. Engines, propellers, autopilot, radios, landing gear, and fuel system maintenance has all been addressed. I can’t wait to dig in and do these flights in an orderly and safe fashion. Once the bugs are worked out on those initial flights, Matt and I agreed he’ll do the next annual after we are flying again. After that I’ll transition up north to a different shop, closer to my new base. I’m actually re-thinking that and will instead just work out the kinks with him and do the next annual elsewhere. I’d like to start doing Angel Flights again, and travel with the wife. Upcoming posts: Very soon now, I’ll start working on an informative post covering the jet flight with Eric I talked about. 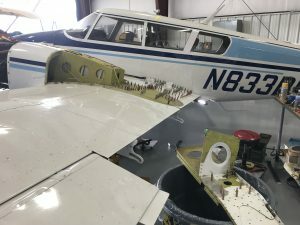 Lot’s of pictures to share of the westwind I was able to fly, including valuable maintenance and pre-flight information. I have my own distractions, including an upcoming ride with the FAA. I’ll be taking a check-ride of sorts – evaluating me as I give one to a client. That will make me a TCE (Training Center Evaluator) who gives progressive check-rides to clients. The process is new to me, but is really not much different than what you do as an instructor delivering an IPC. I’ll write about that experience when it gets here. Fixing the music: I thought about what might be happening to my music system all the way home – in the background music of my mind anyway. Pulling into the garage I had a few new ideas to try. It could be that the SIZE of the thumb drive was over-whelming the bike’s audio system. That would be disappointing, but it could be the cause. I’m thinking the software could be choking when it tries to build an index of almost 3000 songs. Maybe that is also why the next track / previous track controls don’t work – the Harley system could be slow and limited. It could even be the reason why the system locks up and stops responding after an hour of play as well. Simply too much data. To test that theory – I removed half of the 16 gig drive data, and then halved it again. It had no effect, and I poured another cup of coffee. Next I decided to look for corrupt files and did a small test. Bingo! Turns out that many of the files were from original CDs that I’d owned and converted on a windows box. The windows media format (WMV or WMA) would not play on this system, and was the reason for the lock-ups. I found an app I’d already bought some time ago, and used that to develop MP3 file copies of all of those. Now I have a thumb drive with ONLY MP3 files on the drive. The music no longer locks up and the shuffle now works, but for some reason I still could not use next and previous track functions. During testing I happened upon an album selection feature and decided to clean up my files further. I used an app to consolidate the music into consistent albums (1960’s, 1970’s, etc.) that would make it easier to select a smaller grouping of music. If I can’t get next track to work, at least now I can pick a group that works for the moment. Not wanting to give up, I went through all the features of the Harley infotainment system for ways to compensate for the loss of the next track feature. That was when I found that I’d inadvertently turned off a seek function on the bike, and turning that back on made all the features and functions come back alive. I have no idea what this feature is really intended to control, but it was the cause of the next/previous track function not working. Now I have most of my music and comedy files loaded on the drive; all categorized by years and/or genre; and all of the music features work. Loving it. I may even buy a 64 gig drive and put ALL of my music on it. That’s a project for another day though. Fly safe…. It’s gonna be a good year.